This post is brought to you by Vroom. All opinions are my own. As parents, we can get lost in the day to day routine of life and don’t realize that there are countless moments daily that give us the opportunity to teach and nurture our children. Some we take advantage of, and some we don’t realize are those moments. Putting your child to bed at night, kissing her and telling her you to love her, is giving her the security she needs to feel safe and loved. Sounds so simple doesn’t it? It is the little things we do all day that have an impact on our child’s lives. The first five years of your child’s life is critical in building a foundation for future learning and thriving as an adult. This is what the Vroom initiative is about: you already have the tools you need to nurture your child’s mind. Every day is a new opportunity to find fun ways to build your child’s brain. In that respect, you are a superhero! 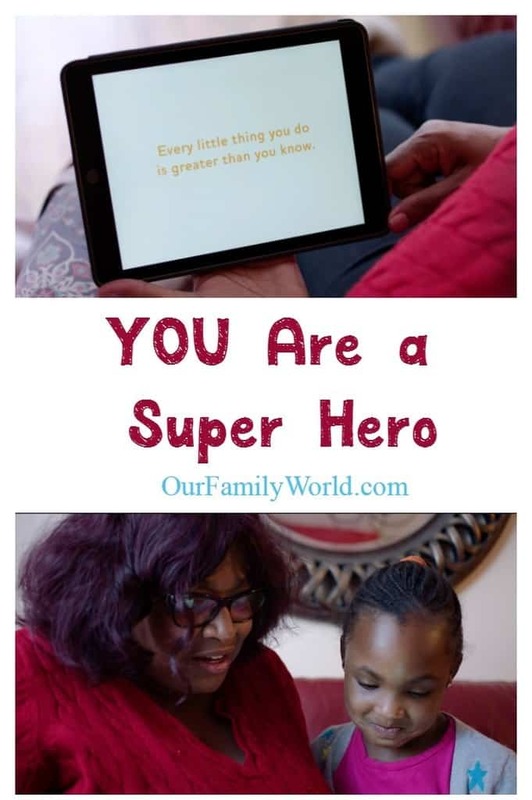 What little things do you do every day that makes you a superhero in your child’s life? Tell me in the comments! Watch this video and you will understand that you are what makes a superhero. Have the tissues close at hand when you click play! This video will bring happy tears to your eyes. I try to pay attention to things and let my child do more during the day. For example, when I am doing laundry, I let my daughter sort the socks and put away her clothes. She loves to help! When we go food shopping, I give my grocery list to her, and she helps me to find what is on it. She is working on becoming a better reader, and helping me with my food list gets her excited to read. My son is just one, and you can tell by his little face that he is soaking up every little thing he comes in contact with and every word I speak to him. He tries to copy expressions and body movements and loves to please me, which is why I get goofy and do a happy dance and claps when he can point to his nose when asked! Vroom gathered some caretakers together with the children they cared for and had the kids create something special for them. Camellia is Cammie’s aunt, who became her foster mother just one month after she was born. From not having any children of her own, Camellia took Cammie in and wanted to give her the best possible life she could. And like the rest of us, whether we birthed our children or not, she can only hope she is doing a good job. Camellia probably doesn’t realize that by doing what she does daily, trying to do her best to raise Cammie, by simply making meals together, playing, and doing household tasks together, that she is leaving an imprint not only on her daughter’s brain but her heart as well. Every little thing you do is greater than you know. Learn more about Vroom and how they can help you unleash the tools you already have to make your child’s future brighter. Check them out on Facebook and Twitter to keep up with the news. 7 Summer Hacks You Need to Keep Your Cool! This is definitely a great campaign especially for us parents. Every child deserves a superhero! My youngest children tell me all the time that I am a super hero because I love them, pray for them and am always there to take care of them. Vroom sounds like a great project for moms. It gives them additional tools to be even more awesome! Aww, this made me sad. There are so many days when I will yell at my son for being “bad” just because I am stressed. I need to take the time to appreciate my kids when they are young. Being a parent is definitely hard work! I consider myself a superhero because I am able to plan and juggle our hectic family schedule while still making sure everyone feels happy and included. I think I have an email from Vroom, I will have to look as this sounds awesome. I love the theme behind Vroom so much! Wow, what a powerful video! We do take for granted the things we do day in and day. The truth is we don’t always see the beauty behind our actions. Thank you so much for sharing this, it absolutely touched my heart. I really like this! A superhero comes in many different forms! She sounds like an amazing woman! It is amazing what little things mak ea huge difference in kids lives! She sounds amazing. I think parents are often super heros even though kids don’t always see it. Most parents go through great lengths to make sure our kids are happy and healthy. Vroom sounds wonderful! I think everyone is a superhero in their own way. We all have something great about ourselves that makes us special. Vroom sounds awesome. I have two toddlers so I will be exploring this further. Vroom sounds amazing! I also agree that all moms are superheros! Us moms are the building blocks to help our kids to reach their full potential and goals. Vroom sounds wonderful, I want to make sure all three of my kids know that they can do anything they want and they have the potential to as well. Vroom sounds so awesome. Every mother I know is a superhero in my book! We do so much for so many people and all at once usually! I love this! We moms are TOTAL superheroes. We are one of the key factors in helping our kids reach their full potential. #GoHondaCRV part 1: Bears, Beavers and Spa! Not in the car!